That’s basically how a panic attack can be described and even most people in the world will experience a panic attack once or twice in their lives. The good news is that they can be treated and if you haven’t had one in your life then it is very improbable that you suffer one panic attack. However, if you have suffered one panic attack then it is more likely that you suffer another in the near or far future. If you constantly have panic attacks then it is considered that you are suffering a disorder called panic disorder. There’s a famous quote from “Anonymous” telling how a panic attack feels that a lot of people suffering panic disorder identify with. It literally feels like my world is falling apart — like whatever thing that has just happened is apocalyptic, even if it’s actually a really small thing. Having chills or sweating too much. A sense of doom and/or terror. Feeling dizzy, or even fainting. Numbness in the hands and fingers. Maybe you already know or at least had heard about these symptoms. But It is very likely that you hadn’t heard too much about the next symptoms I’ll mention. These are just a few on the most uncommon and unknown ones. Remember that a common symptom is being sweaty. 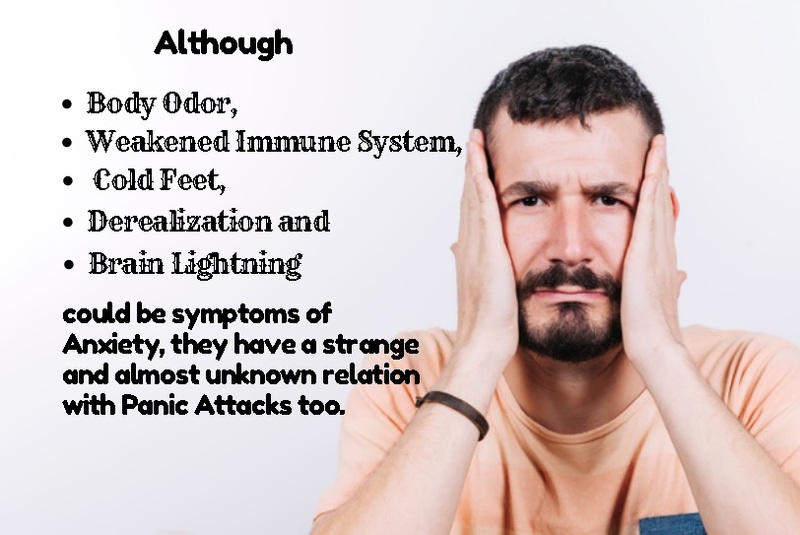 This is because there are rapid changes in hormones and the immune system gets weakened, and all of this without any doubt can lead to an increase in body odor. While nobody knows with 100% certainty what’s happening inside a body there is some research that leads to believe there’s a strong connection with that anxiety and stress affect your immune system. This could be a reason why catching a flue and being is easier while having depression, anxiety, and even panic disorder. You tend to become more sensitive to temperatures changes and your blood circulation suffers changes too, which can develop the result of developing cold hands and cold feet. It means feeling like being detached from everything that surrounds you. Everything feels unfamiliar during panic attacks, even if has known that environment for years. This is probably the most unknown because it even doesn’t have a clinical term. The term usually described for this symptom of anxiety and panic attacks is “brain shivers”. Patients also describe it as electric shocks in the brain and head but there are times that these electrical sensations can be sensed around the body too. The thing with Panic Attacks is that you live in the eternal expectancy of when will it come the next one. And that won’t let you experience life as you should, that put you out of the mindset of being in the present and enjoying every moment because you’re too worried about suffering another panic attack. While I cannot say you’ll be totally cured or it will be an easy thing to do, I think going out and doing whatever you can to live a full and great life is both a cure for this anxiety and a way to make sure that panic attacks cause fewer problems in your life.